CHICAGO (Sept. 15, 2017) - The BB&T Soccer Park at Bryan Park in Greensboro, N.C. will host the Girls' Development Academy Spring Showcase from April 6-10, 2018. The showcase will be the initial Girls' Academy event as 2017-18 marks the inaugural season for the program. The U-14, U-15 and U-16/17 age groups from all 69 clubs across the Girls' Academy will attend the event for meaningful competition against other teams from the nation's highest level of youth soccer. "Bringing all the Girls' Academy Clubs together provides opportunities for players to compete against teams they normally do not see during their regular 24-30 game season," U.S. Soccer Girls' Development Academy Director Miriam Hickey said. "It also gives academy directors and coaches the chance to interact with each other at Academy meetings hosted by U.S. Soccer while the clubs will be in Greensboro. The U.S. Soccer Technical Advisors and administrative staff from Chicago will handpick the match ups to provide the most meaningful three games for each team during the Showcase. U.S. Soccer scouts and College scouts will be in attendance and every game at the showcase will be scouted, giving every player the chance to showcase her talents and take another step to reach her full potential." 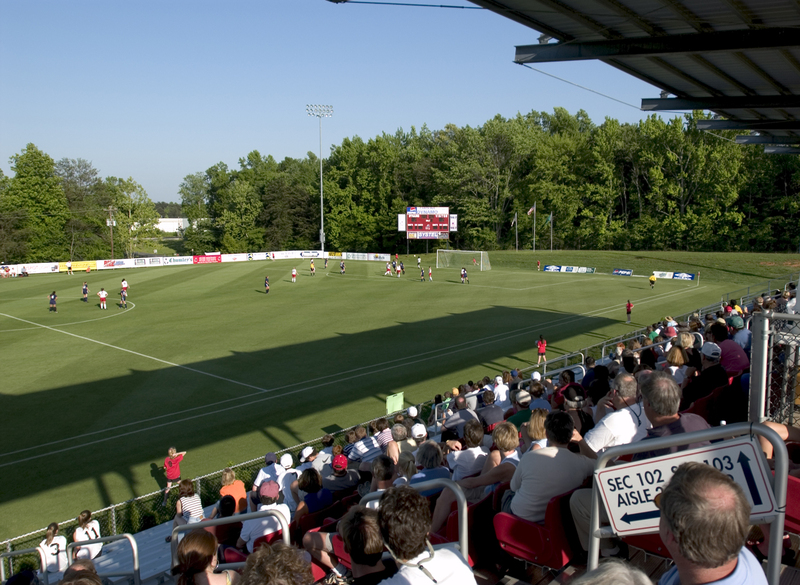 The BB&T Soccer Park at Bryan Park soccer complex features 18 full-size grass fields used exclusively for competition, highlighted by 3,000-seat McPherson Stadium. Other amenities include an on-site restaurant, locker rooms, concessions, offices and conference rooms. When the Development Academy first started in 2007-2008, the soccer complex was home to the Boys' Academy Summer Showcase, which featured 126 teams competing in 189 games across the former U-15/16 and U-17/18 age groups. "Greensboro United Soccer and the City of Greensboro are very excited to be hosting the inaugural U.S. Soccer Girls Development Academy Spring Showcase," Greensboro United Soccer Association Executive Director Pete Polonsky said. "We are proud of our facility, its recent upgrades, and that U.S. Soccer has selected our site for this great competition. Our community does a fantastic job in supporting the groups that we host, and we look forward to the opportunity to showcase that to the Girls Development Academy players, coaches, and supporters next April." The North Carolina area represents a prominent market in the Development Academy with two Academy Clubs located in the state: Charlotte Soccer Academy and NC Courage. Showcase events are a cornerstone of the Development Academy program. Held seasonally in the fall, winter, spring and summer, the Showcases feature competition between the top teams nationwide. With the focus on player development, the structure of the Showcase provides an elite environment for play-up opportunities and varied competition. The events are also a haven for National Team, professional and collegiate scouts. Each of the 309 boy's games played during last June's Summer Showcase and Playoffs were scouted by U.S. Soccer and many others. The Academy's annual Winter Showcase, held in conjunction with the Nike International Friendlies, will feature U-16/17 and U-18/19 teams from the Boys' Academy and U-15, U-16/17, and U-18/19 teams from the Girls' Academy in Lakewood Ranch, Fla, from Nov. 30 to Dec. 4 and Dec. 6 to Dec. 10, respectively. Now in its inaugural season, the Girls' Academy features 276 teams from 69 total clubs across four age groups: U-14, U-15, U-16/17 and U-18/19. Following a comprehensive review of the boys' youth soccer landscape in the United States, the United States Soccer Federation launched the Development Academy in 2007 to create a more structured player development environment for elite players to develop to their highest potential. The review was based on extensive analysis of international soccer clubs, other sports training environments, education and other disciplines that require dedicated training and practice. From the onset, the program's mission has been to impact everyday club environments to develop world-class players. After 10 successful years, the 2017-2018 season marks the launch of the Girls' Development Academy. The program's philosophy is based on increased training, less total games, and more meaningful games using international rules of competition. The Academy is the highest level of youth soccer in the U.S. and the program impacts everyday club environments to maximize youth player development nationwide. As a global leader in women's soccer, the Girls' Academy serves to grow the women's game and ensure that the U.S. continues to compete and win at the international level. Development Academy travel partner, Anthony Travel, will assist clubs with all of their travel and housing needs and will handle all hotel bookings. Travel information for the Girls Spring Showcase can be found at: www.anthonytravel.com/us-soccer-development-academy-girls-spring-showcase.